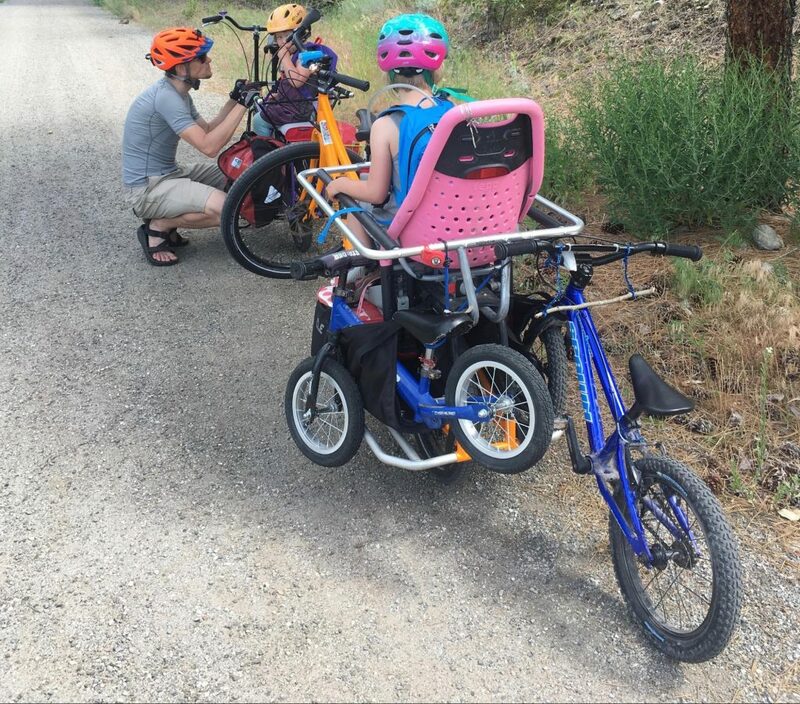 Our family has been riding longtail cargo bikes since 2012, starting with a Yuba Mundo, then moving to an Xtracycle Edgerunner (2014) and a Bike Friday Haul-a-Day (2017). All three styles are very unique, but the Edgerunner has been my absolute favorite. I have had so many adventures with this bike, big and small. I cannot imagine my life without it. People say that longtails are cargo bikes that “ride like a bike” which is a statement made in contrast to front-loading bakfietsen that have linkage steering, a feature you either learn to love or love to hate. Of all the longtails I have tried, the Edgerunner feels the most “like a bike”: it is zippy, peppy, and smooth. And, most importantly, it is so completely functional with lots of accessories available to help it meet your various needs. The first longtail designs had full-size (26”) rear wheels. The Edgerunner is unique in that it adopted a 20” rear wheel. There are several benefits to having a smaller rear wheel, namely a lower center of gravity, easier gearing, and increased wheel strength. 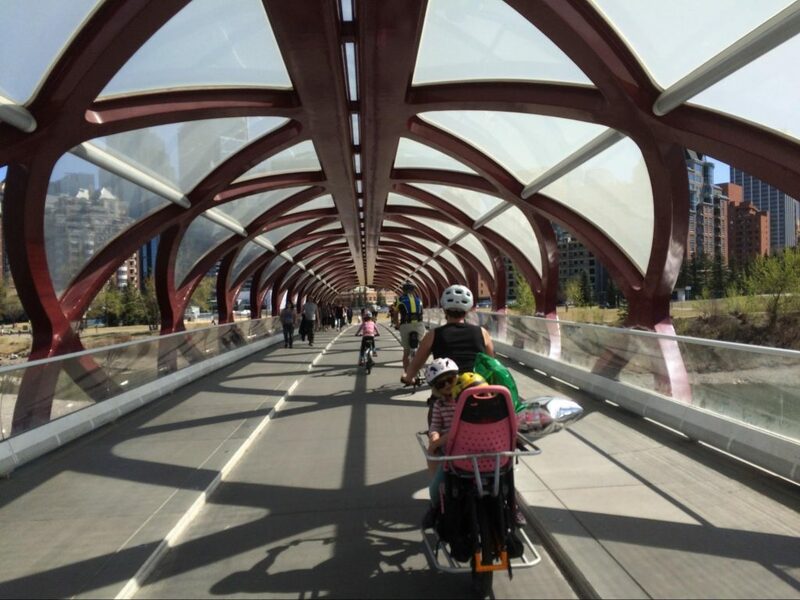 The 20” rear wheel significantly reduces the center of gravity of the cargo which provides increased stability, especially with respect to children who inherently sit perched higher up on the rear deck of the cargo bike. This is in contrast to packages which might be slung low on either side of the rear wheel. This design can work very well especially for riders that have a smaller stature and/or those who carry live cargo (i.e. kids), especially when getting on and off the bike or when starting/stopping. When looking at ease of climbing, a 20” wheel wins hands-down over a 26” wheel with the same drivetrain setup. Lower gear inches can be achieved with a smaller rear wheel which makes climbing up hills fully laden with kids and gear much easier. This is a really helpful feature if you live in a hilly area. The smaller the wheel, the stronger it is. This is a great benefit when carrying heavy cargo! Who wants to deal with untrue wheels, anyway? While smaller wheels may not roll as smoothly, when set up with a balloon tire, the ride is still very smooth. Many cargo bikes come in one-size fits all, but when you are on the shorter end of the spectrum, depending on your body build, you may find that approach does not work well for you. This is especially true for many female riders and is the reason why we sold our Yuba Mundo in favor of a S/M sized Edgerunner. Once we had a heavier payload of two kids to carry around, the bigger sized Mundo was too much for my 5’4” frame. Xtracycle makes the Edgerunners in various sizes. Older models come in S/M and M/L; newer models are offered in Small, Medium, and Large sizes. Also, another feature Edgerunners have in their frame design is a slight dip in the top-tube. While not a true step-through, this does help when dismounting. Since we purchased our Edgerunner back in 2014, Xtracycle has designed a true step-through model now, called the “Swoop”, and it looks fabulous. Perhaps you have tried riding a bike with a child seat on the back and found it twitchy, wobbly, or just handled in a way that made you feel uncomfortable. Chances are this bike was not designed to carry 20+ pounds on its back. Cargo bikes are designed to carry hundreds of pounds. 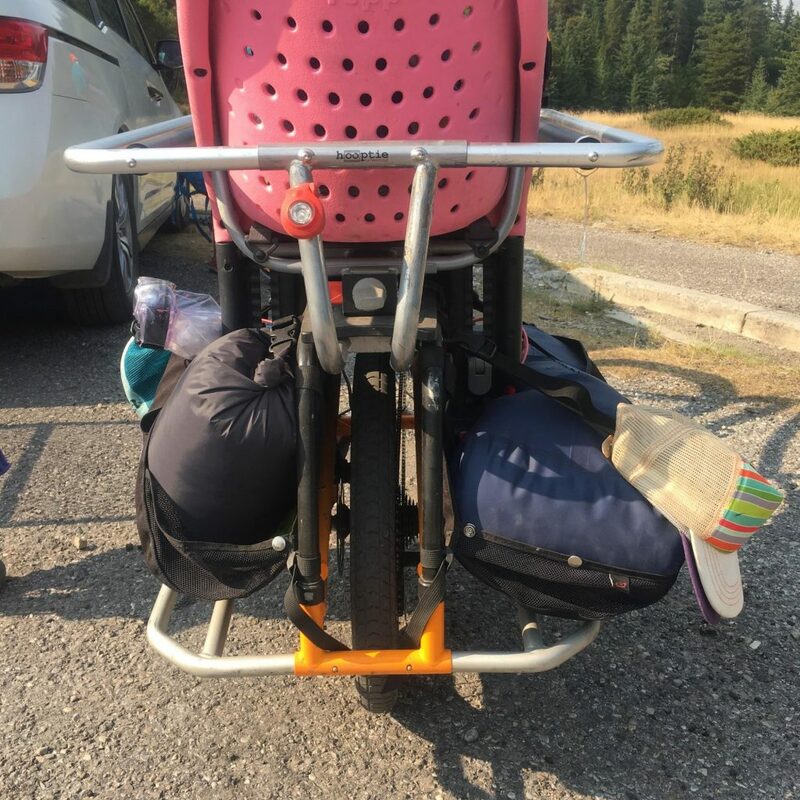 The payload for the rear rack of the Edgerunner likely accommodates more than you will ever need, including being more than enough to carry a kid or two, your groceries, camping gear, and/or whatever it is you need to use the bike for to go ‘car lite’ or car free! You won’t feel the same twitches and wobbles because the frame is designed specifically to be used under a load. Yes, you will notice that you are carrying weight, especially when starting or stopping or if your cargo is particularly wiggly, but when you are riding you will find the journey to be much smoother than your average bike. Earlier models of the Edgerunner do not have mounts for a front frame rack. Newer models do and I am really glad that they moved to add this feature. I like having a front rack for extra cargo space, but I prefer them to be integrated with the frame and not affecting the handling of the front wheel as they would if mounted to the front fork. 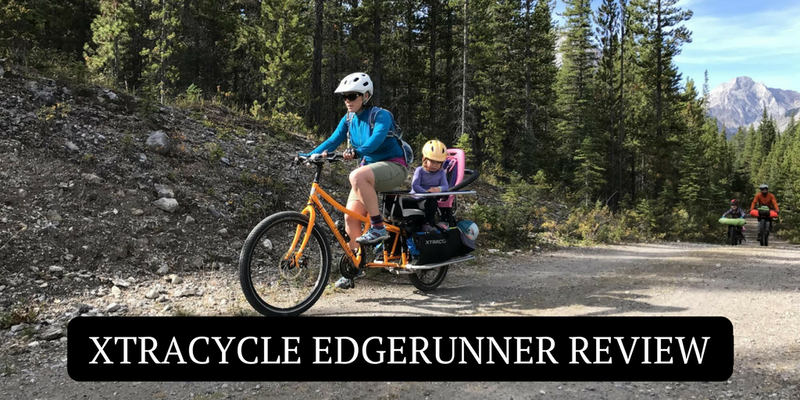 The Edgerunner is the bike that really got us excited about bike camping or even basic bikepacking as a family. 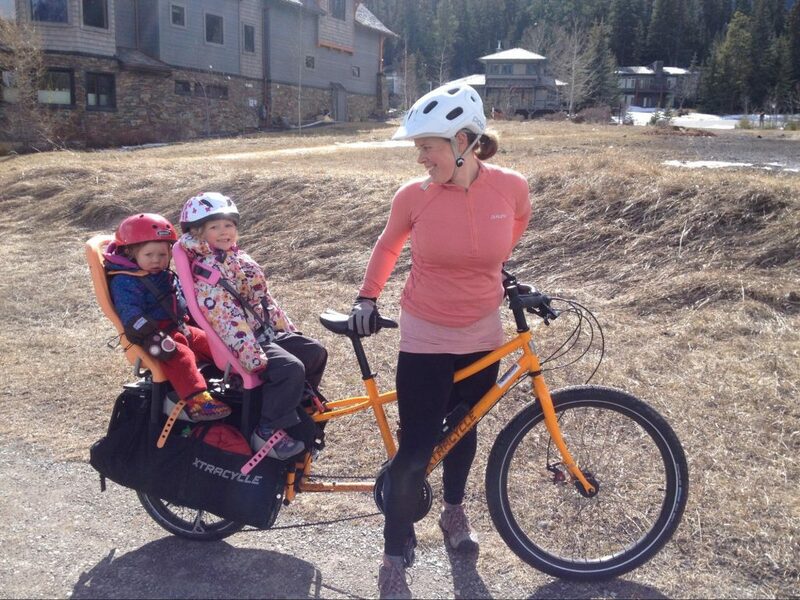 Longtails are excellent expedition machines and are super easy to pack, even for a family of four. The Big Ben tires that come stock with the bike are durable and provide enough cushioning to make gravel road riding comfortable. Watch out for the low rear derailleur if you are riding on rough terrain; consider moving to an internal hub if you do much off-road riding. This is not an issue for city riding. I highly recommend riding bikes somewhere with your kids, fully loaded, to go camping! So much fun–the stuff memories are made of. The Edgerunner does fit on our city’s light-rail system (allowed during off-peak hours only). One of my favorite features of longtails is their awesome ability to drag kids’ bikes. This is a really helpful feature for your toddler who insists on bringing their balance bike with them everywhere but can only travel short distances on smooth surfaces or for your young child who rides a pedal bike but tires easily or is not proficient in traffic. With the U-tube accessory, you pop the front wheel in its slot and then use a clip from the cargo bag (or a freestanding strap) to connect the frame to the bike. The rear wheel drags effortlessly behind and your little buddy has room to sit on the back of the deck. Longtails are a great addition to your bike fleet and the Edgerunner is a wonderful model to choose. I have owned and used three different brands of longtail and the Edgerunner has been my absolute favorite. Ultimately, I do prefer a bakfiets style cargo bike for city use, but longtails are great for all around riding, including adventuring. Also, their price point is usually much more affordable. As a parent, I recommend the Edgerunner wholeheartedly for your family biking needs. This cargo bike is peppy, climbs well, and “rides like a bike”. Lindsay Bliek is a retired teacher and science museum educator, full-time parent, and lover of bikes, gardening, her kids, and getting outside. 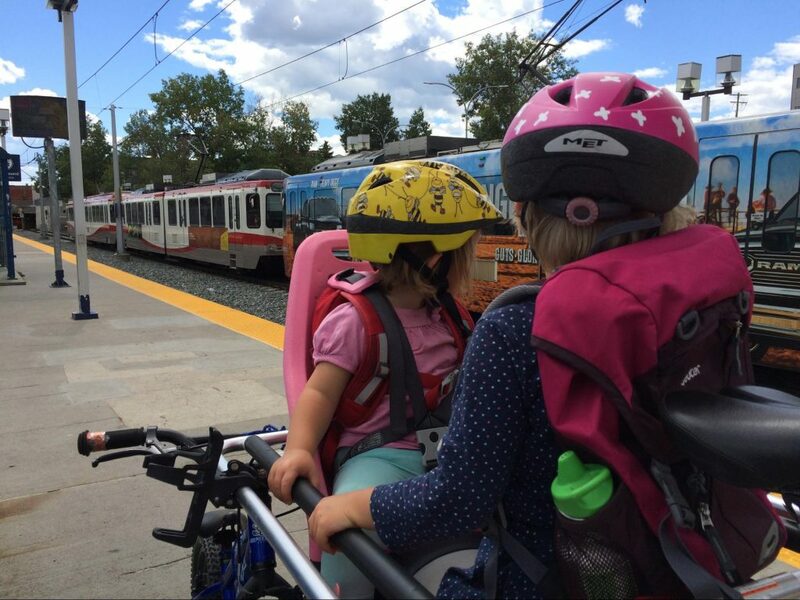 She is the editor and principal writer over at This Mom Bikes, a blog all about biking with kids, adventuring by bike, bikepacking, travel by bike, urban biking, family biking, active transportation, and pretty much anything about life with bikes.